A century ago the Victorians, obsessed with touching the spiritual plane, seized upon electrification as the key to reviving the dead. Mary Shelley describes her "extreme astonishment" with the phenomenon in Frankenstein and soon quack scientists were travelling Europe engaging in grisly reanimation shows - referred to as 'galvanism'. They'd hook up frogs to an electric current, causing them to dance and twitch in a parody of life. Now I'm the frog. I sit with electrodes gloopily suckered onto my arms, the sound of static crackling in the air and an artist wearing a neural interface staring intently at me. My muscles wriggle about under my skin like a couple of badly behaved snakes, fingers curl up in strange patterns and occasionally my entire elbow tightens and jerks towards my body. 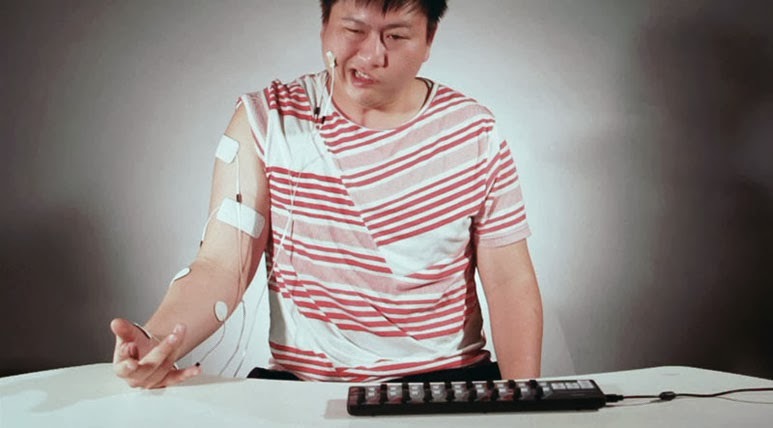 This is all the doing of Singaporean artist Choy Ka Fai: the man controlling my arm using a NeuroSky brain/computer interface. Having someone else's brain in control of your body is one of the more odd sensations I've experienced of late - certainly one of the most intimate. And we'd only just met! Surrounded by laptops, cables and various gadgetry, he has the faint aura of the mad scientist to him as he works away in arebyte Gallery. This residency, titled The Choreography of Things is a continuation of his projects Prospectus for a Future Body and Softmachine - explores neurological and physiological data arising from contemporary dance. Dance is one of the purer forms of communication, a nonverbal dialogue of human motion instinctively understood by any human being. But though the dancer exposes themselves to the audience in every movement they make, their mind is still a closed garden. Ka Fai throws open the gates of this garden, his performances a combination of lighting, visuals and synth sounds entirely extrapolated from the neural activity of the dancer. 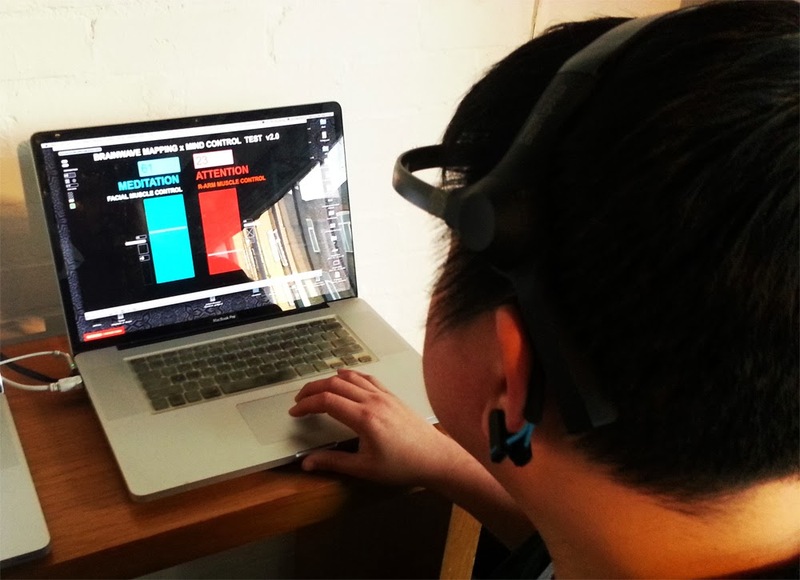 As we watch this we're seeing them inside and out, brain and body as one streamlined communicative device. In this moment the dancers are 'transparent people', everything exposed. But this is a two way street; Ka Fai doesn't stop at acting as facilitator, but as controller. Using electrical stimulation pads, he maps the motions of iconic dance performances onto himself and professional dancers, their bodies automatically responding to sets of electrical stimulations; a human programming language that turns people into puppets. I usually make it a rule to stay away from devices labelled "MIND CONTROL TEST". Using people as puppets has a definite ring of supervillainy to it. Ka Fai is calm, friendly and open, but even so he still feels just a few steps away from setting up a lair in a creepy abandoned dance studio in Gotham City and battling Batman. Much of this is down to the immediate intimacy that his technology can't help but create. Curious as a cat I wanted to check this out for myself, and as you feel the NeuroSky transmitter pressing against your forehead, and the clip gently pinching your earlobe you realise that as of this point you don't really have any secrets from him. His bespoke software neatly colour codes the data coming out of your brain, first the wildly fluctuating 'Raw' brain wave date data, separate columns marking everything from delta deep sleep 'dreaming' waves, to low beta sensory motor rhythms and theta learning and memory waves. The software translates this data into sound, the most easy think to detect the *click* as you blink and the sensory data blips. More interesting are the 'Relax' and 'Focus' columns. As I close my eyes and imagine a sun-dappled forest I start to chill out, and a rising tone rings out. When I start to focus by doing some maths in my head another tone begins to sound. The upshot of all this is that right away you realise that there are no secrets from this machine, as far as I can see you cannot fool it - Ka Fai is literally reading my mind. After hearing so much about these experiments with dancers, I'm eager to see what it's like to be shocked myself. Soon I'm strapped up with four electrical pads, my arm plugged into Ka Fai's brain. The cool adhesive sticking to my arm is reminiscent of a medical exam, but Ka Fai is no doctor and quickly I start to wonder what the hell I've let myself in for. Adding to the worry is the off-handed remark that "we definitely don't want these pads anywhere near your heart". It's suspenseful sitting there, wires trailing from you, waiting for the shocks to begin - though as with most things the wait is the worst part. The first zap surprises me, my hand immediately curling into a claw and my forearm jerking forwards. It's not painful but boy it feels odd. Appropriately, given that I'm now essentially a human puppet, the sensation feels like someone's threaded wire through my muscles and is yanking hard on it, drawing my arm into a series of contorted poses. It's possible to fight it, but it's easier to go with the flow, to allow my limb to rebel, the sight of my fingers twitching away without any input feeling alien in a tripped out kind of way. Curious as to how Ka Fai's thinking is moving my arm I ask if I can wear the NeuroSky headset, thus allowing me to shock myself. Unfortunately, this quickly puts me into a feedback loop - I'm being shocked because I can't focus and I can't focus because I'm being shocked. Now I'm sat there with my arms outstretched like some screwed up marionette, jerking away as I inadvertently zap myself over and over again. This is one of the odder Saturdays I've had of late. All this tinkering with brainwaves and electrical muscle signals leaves me with the disquietingly mortal sensation of body-as-machine. As we chat about the future potential for work like this Ka Fai mentions an interest in recent cognitive studies by the Max Planck Institute that seem to prove decision-making takes place in the brain up to seven seconds before you consciously 'decide' to do something. Using similar technologies to what we're working with here, scientists can effectively know what you're going to do before you do. This opens a can of worms when it comes to consciousness, suggesting that decision-making is an illusion of the brain. These experiments are cutting-edge stuff, art grappling with biomechanics and medicine. One of the things I enjoy most in art is when something has a physical impact upon me, be it a rush of heat from a flame, tasting something odd or simply being thrilled. This work literally got inside my head and twisted my body. Yeah it was weird, but it was also fascinating, and I have huge admiration to Ka Fai in utilising these new technologies in such an accessible ways. If you're at all interested, I'd recommend heading along to arebyte where you can see a demonstration or (if you're feeling brave) take the plunge yourself. This is the first residency in arebyte's 2014 programme, which focuses on new media art and performance art, with an eye to exploring the use of new technologies and their intersection with the contemporary environment. If they carry on like this 2014 is going to be one hell of an interesting year at arebyte. Choy Ka Fai is in residence at arebyte Gallery, Unit 4, White Post Lane, Queen's Yard, E9 5EN until 2nd February 2014 (Tue-Sat 12-6pm). There is a closing event on the 30th of January.